My husband invites a squirming me to sample roasted guinea pig (el cuy — pronounced koo-ie) in a specialized restaurant in Cuenca, Ecuador. A local insists we cannot leave Cuenca until we enjoy their favorite meal passed down from the Inca. 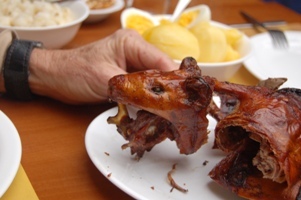 For those who consider the guinea pig a pet, a visit to the Guajibamba restaurant is not advised. The Inca used guinea pigs in ways other than food. The sensitive little mammals were kept inside native homes because they acted as warning bells, detecting earthquakes before they actually happened. When an earthquake was imminent, the little pigs ran around randomly squealing. The people recognized their bizarre behavior and immediately left their homes. Medicinally, the local shaman used the guinea pig as a healing source. Holding the rodent in his hands and chanting, he passed the animal over and around the patient, exorcising the evil spirit and sickness from the body. After the treatment, the rodent was killed and gutted. According to our guide, the shaman could tell from its black color which of the patient’s internal organs had been affected. The process served as an Inca x-ray. Guinea pig meat is apparently healthy: high in protein, low in cholesterol and easy to digest. Still, looking on your plate at the spit-roasted creature with bared fangs and paws sticking straight up in the air is a bit disconcerting. It is necessary to book a reservation in advance since a fresh guinea pig takes at least one hour to roast. The dish is served with boiled potatoes, hardboiled eggs, corn and a hot sauce. 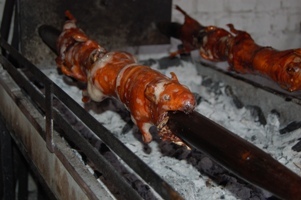 After a few bites, my husband finds his roasted guinea pig, including the liver, palatable — even delicioso. And before he gets a chance, I reach over, break off and finish those crispy, crackling ears.